Side scan sonar image of the shipwrecked steamer Roberval - shows port side with remains of the iron posts that held the railing that was located both sides of the ship. Bow of shipwrecked steamer Roberval - shows large winch for anchor, small winch to the right for lines to boom for loading cargo. Mid-ship remains of shipwrecked Canadian steamer Roberval - The top structures have fallen away as it remained vertical in the lake for hours. Rochester, New York – The Canadian steamer Roberval which foundered in 1916 when struck by a rogue wave has been discovered in the deep depths of Lake Ontario. The Roberval is one of only two undiscovered steel clad ships still in the lake and has been heavily sought after by shipwreck hunters. In mid-October, shipwreck explorers Jim Kennard, Roger Pawlowski and Roland Stevens located the steamer off Oswego, NY while surveying a section of Lake Ontario for historic ships. In late September 1916 the Canadian steamer Roberval carried a huge load of 248,000 board feet of lumber destined to be made into matchsticks and boxes by the Diamond Match Company in Oswego. The steamer departed the town of Cape Vincent along the St Lawrence River in the early afternoon and within an hour was on Lake Ontario heading south to its final destination. As the afternoon progressed, northwest winds on the lake increased to over 30 miles per hour. These winds were not typically excessive for this ship but the large stack of lumber piled on deck was acting as a sail making it very difficult for the steamer to stay on course. As the winds increased so did the waves, reaching heights of over 8 feet, which continually hit the Roberval rolling her from side to side. Eventually, several waves combined into one huge “rogue” wave that caused the steamer to roll over on its starboard side spilling a portion of the deck cargo. This was followed by another large wave which caused the remaining loose cargo to slide off the deck and into the cabin at the aft portion of the steamer. Everything happened so fast there was little time to know just what was going on. The waves smashed the galley window and flooded the gangway. The upper structure of the cabin area was bashed in and one of the lifeboats was smashed. As water filled the engine room the stern slowly sank. Four sailors were attempting to man the remaining life boat when suddenly the Roberval took another list throwing three men into the water and the Chief Engineer into the lifeboat. First fireman, Messenau, opted to stay with the pile of floating lumber while the other men climbed into the damaged lifeboat. The second fireman, Seguin, who had been down in the firehole, managed to reach the deck just as the ship plunged under. While he stood on the port side bewildered, a pile of sliding timber struck him in the back and head knocking him into the lake where he drowned. His body could be seen about five feet below the surface of the water when the three sailors started to pull away from the wreck. The cook, Miss Patent, was hanging on for dear life at the bow rail. Captain Eligh brought her aft where he told her to hang on to the iron railing running around the cabin structure. However, as the stern of the ship sank deeper into the water she was thrown over the starboard side into the lake. Following her, the captain grasped several timbers, slid down the deck and then leaped, landing in the water within a few feet of where the cook had sunk several feet underwater. He grabbed her by the hair and dragged her to a nearby timber for support. A short distance away the first mate was struggling to get enough lumber to make a raft. The three of them combined their efforts to build a larger raft to float on. Above them in the forward deckhouse of the sinking ship, which was now nearly vertical in the water, appeared the wide eyed young deckhand, Leroy, in one of the porthole windows. His calls for help could not be heard over the roar of the wind and waves. The unfortunate lad was trapped by falling lumber blocking the entrance and would eventually go down with the ship. The three men in the lifeboat could see the others clinging to the mass of floating timbers which covered the lake in all directions. They made several attempts to rescue them, but were buffeted about by the waves and were unable to reach their companions. As darkness fell the men in the lifeboat had to abandon their attempts at rescue and focus on reaching the safety of shore many miles away. It was nearly sunset when the Roberval lost its deck load and began to slowly sink below the surface of Lake Ontario. It was temporarily stopped in a near vertical position by the floatation provided by150,000 board feet of dry spruce lumber in the hold of the steamer. The Glen Allen, a sister ship 7 miles behind the Roberval at the time of the accident, saw what they thought was the sun reflecting off the cabin windows. In fact, it was a reflection of the sun off the vertical wet hull that was now protruding high out of the water. The bow of the lifeboat had been severely damaged and was leaking badly. The three men in this small craft bailed water and rowed for nearly 9 hours all the way to the port of Oswego, a distance of over 16 miles. For the next 22 hours Captain Eligh and three crew members tried to hold their make shift raft together. The winds abated by morning and then shifted from out of the southwest blowing the mass of lumber and raft away from the eastern shore of Lake Ontario and out into the open water of Lake Ontario. For nearly a day the Coast Guard from both Oswego and the Big Sandy Life-Saving Station searched for survivors of the Roberval. In mid-afternoon the following day a flock of birds resting on debris in the water were sighted by the crew of the Big Sandy life-saving station boat. They headed to that location to find the four survivors of the Roberval alive and sitting on top of the pile of lumber that constituted their life raft. By the next day the deck load of lumber could be found from the east shore of Lake Ontario all the way to the St. Lawrence River. The Roberval was built by the Polson Iron Works in Toronto, Ontario, Canada in 1907 and was owned by Captains Eligh and Hall of Ottawa. The steamer had a registered length of 128 feet, a beam of 24 feet and a capacity of 344 net tons. The Roberval was known as one of the staunchest steel boats on Lake Ontario at this time. She was built for the salt water trade, but had been on the lakes for years carrying lumber between Ottawa and Oswego, and returning with coal back to Canada from the Oswego terminal. During the past two years our team has focused its search efforts on locating the historic shipwrecks in Lake Ontario off Oswego, New York. Earlier this season, we reported the discovery of schooners Atlas, lost in 1839, and Ocean Wave, lost in 1890. The steamer Roberval was high on our list but not the only lost ship that our team of shipwreck enthusiasts had in our sights. During the 2013 season a large area of Lake Ontario off Oswego was surveyed and several other shipwrecks were found which are now being studied for future identification. By mid-October the marinas are closing up for the season and few boaters are on the lake. On our last day of the 2013 shipwreck search season the waters were calm and the winds light. We did a “Hail Mary” search and ventured far out on the lake to begin our search pattern. Within 90 minutes we were rewarded with the discovery of a shipwreck. 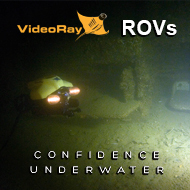 The remainder of the day was spent surveying the wreck to obtain detailed sonar imagery with a high resolution DeepVision side scan sonar followed up by video obtained from a VideoRay Pro III remote operated vehicle. 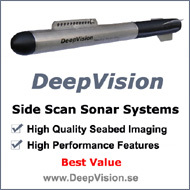 The sonar imagery had already provide us with a good understanding of what we would see when the remote operated vehicle was deployed with its onboard video camera. We surmised that for at least several hours the steamer Roberval was in a vertical position and during that time lost all the structures above its main deck. Gone are the cabins, deck load and much of the decking. The starboard side of the ship has fallen away to one side. At the bow some of the raised deck still exists with a large windless and behind it a smaller windless which was used to raise and lower a boom attached to a mast located just forward of mid-ship. The mast is now broken and part of it extends to the port rail. The port side of the steamer is buried within a few feet of its top port side. Remains of iron posts that were part of the railing can be seen clearly in the sonar imagery and portions of the video. The raised deck at the elliptical shaped stern is visible with what appear as two square bollards still in place, one behind the other. Around the periphery of the ship are other pieces of ship debris. We had a limited amount of time and daylight to explore the surrounding area and will have to return next year to survey many of the objects just beyond the shipwreck. The survey of historic shipwrecks in Lake Ontario was funded by a grant from The National Museum of the Great Lakes/Great Lakes Historical Society of Vermillion, Ohio. Jim Kennard has been diving and exploring the lakes in the northeast since 1970. He has found over 200 shipwrecks in the Great Lakes, Lake Champlain, NY Finger Lakes and in the Mississippi and Ohio Rivers over the past 35 years. In 1983 he discovered a unique horse powered ferryboat in Lake Champlain. National Geographic featured the ferryboat in their October 1989 issue. 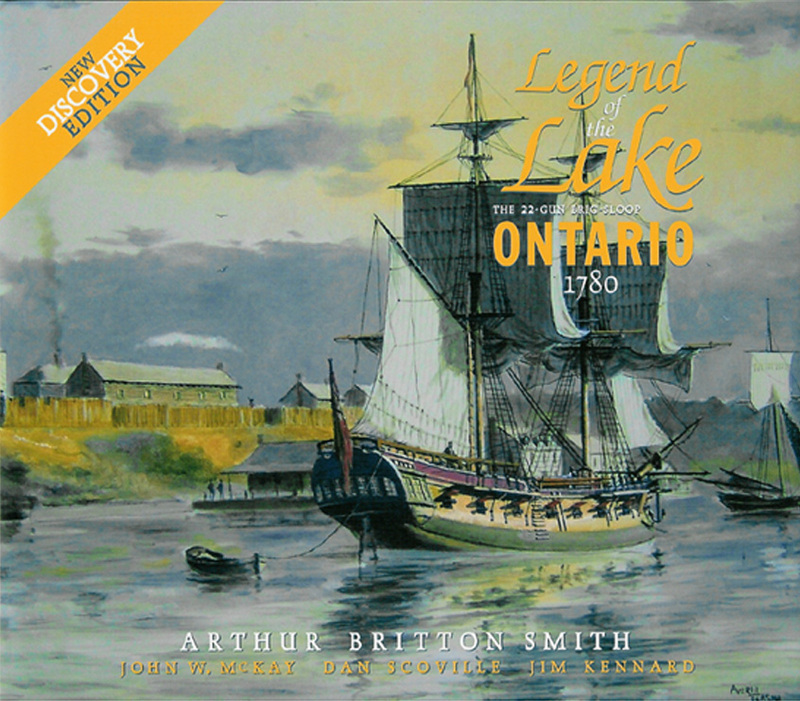 In May 2008 Jim Kennard and Dan Scoville discovered the 233 year old British warship HMS Ontario, the oldest shipwreck ever found in the Great Lakes, and in September 2008 a rare 200 year old "dagger-board" schooner. Kennard is a Fellow member of The Explorers Club. Roland ‘Chip’ Stevens is a retired architect and working artist whose watercolors, many of which have been accepted into national exhibitions, are well known in the Rochester area. A sailor for over 60 years, Stevens has a love of the sea as reflected in his seascapes. A number of his paintings of shipwrecks discovered by the team have appeared in news stories and publications. Based on the ROV video recording and side scan sonar imaging, Stevens created a sketch of the steamer Roberval as it appears today on the bottom of Lake Ontario. You guys have distinguished yourselves once more with this exciting discovery and the very professional documentation you've done! Congratulations for keeping alive so many of these exciting stories!